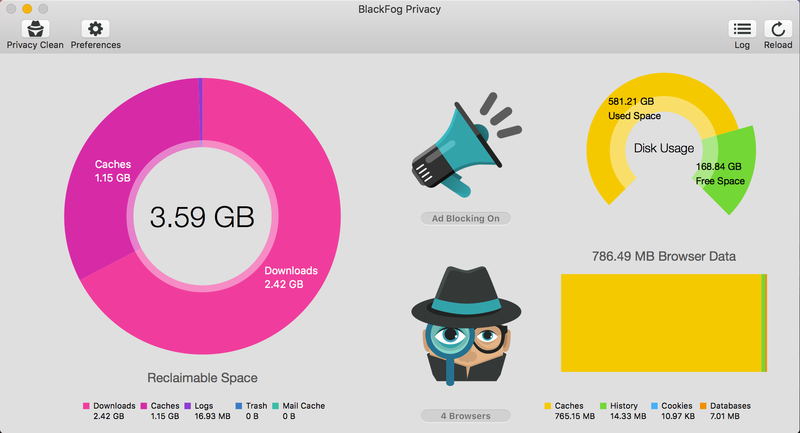 BlackFog Privacy protects your computer from prying eyes and ensures your Mac is safe. By blocking the distribution of malware through advertising networks (malvertising), removing adware and cleaning your computer you can significantly reduce the chance of infection. The main interface consists of a dashboard with several charts and icons showing you the state of various parts of your system. The charts show you the amount of space consumed by the system (left), the drive space (top right) and browser activity (bottom right). The toolbar also allows easy access to preferences and other functions such as Privacy Clean, Log and Reload. The preferences control which features of the product are switched on and control the data being displayed and managed by the Privacy Clean, when it is executed. General options control whether you want to launch the menubar helper, block advertising and/or profiling and which parts of your system you would like BlackFog to manage. Includes reclaimable space and browser data. In addition to switching blocking on and off in the general tab you may also wish to include or exclude specific sites from consideration. Use the White List and Black List options to enter the domains and URL’s you wish to manage. BlackFog can manage the data from several browsers at once. These include Safari, Chrome, Firefox and Opera. Use the toggles to control which browsers data is included in combination with the general tab options. The dashboard also includes icons in the center. The top icon shows the state of Ad blocking. This can also be controlled from the Safari > Preferences > Extensions. The application does not ned to be running for Ad blocking to function as it is installed directly in the Safari browser by default. With Ad block enabled you will notice your browser is dramatically faster and is now generating 40% fewer requests (on average) than before. The bottom icon displays the number of browsers under management by BlackFog and is controlled using the toggles in the Browser Preferences. Malvertising presents one of the biggest threat vectors on the Internet and is routinely used to distribute malware. When Ad-Blocking is enabled you significantly reduce the risk of attack by reducing the attack area available to hackers. Behavioral profiling and tracking allows sites to target you wherever you go. This information is shared and traded across providers, making you the product. Ensure that the Profiling option is enabled to stop being tracked. Privacy Clean executes based upon the settings defined in the General Preferences and against the specified browsers. Use the Privacy Clean to eliminate any forensic trace activity from your user account and browser and also reclaim valuable drive space. BlackFog Privacy also comes with a menubar agent that can be started at login. Ensure the Launch option is enabled in the general preferences and you will see the application appears as a small detective hat in the menubar. You may use this icon to quickly see the state of your drive and whether ad blocking is enabled. You can also use this to quickly launch BlackFog Privacy as needed, to perform any necessary cleaning.